* Added Android social icon. * Added Amazon social icon. * Added Behance social icon. * Added Bitcoin social icon. * Added Bitbucket social icon. * Added Delicious social icon. * Added GitHub social icon. * Added Google social icon. * Added Spotify social icon. * Added StackOverflow social icon. * Added Steam social icon. * Added Stumbleupon social icon. * Added Telegram social icon. * Added Twitch social icon. * Removed Blogger social icon. * Removed Google+ social icon. * Completely rewritten social icons code. * Added mobile hamburger menu icon color feature. * Fixed textual logo shrinking while header shrink is disabled. * Fixed image logo shrinking while header shrink is disabled. * Added (lost) body background feature in customizer. * Added multiple logo upload features (mobile, tablet & desktop). * Added slider missing img files. * Removed pig icon on customizer (re)loading. * Added Elementor plugin to TGM Plugin activation. * Added GoldAddons for Elementor to TGM Plugin activation. * Added new page template "For Page Builders". * Added customize selective refresh support for widgets. * Added Page Buider feature into Customizer (Customize->Page Builder). * Updated logo max height (transport=auto) & (added active callback). * Fixed Google+ social share icon default parameter bug. * Updated infinite scroll to newest version. * Updated Isotope JS to latest version. * Updated NiceScroll JS to latest version. * Added detect child theme and enqueue child theme stylesheet. * Added front page boxes heading feature (Customize->Front Page Boxes->General). * Added footer social icons color feature (Customizer->Footer->Styling). * Added footer site info links color feature (Customizer->Footer->styling). * Added social share for posts & pages feature. * Fixed blog infinite scrool not working for child theme bug. * Fixed navigation 3rd-4th sub menu bug. * Removed includes folder and agama_custom_header.php file. * Removed font enqueueing (Customizer loads it by default). * Removed "get_agama_blue_contents" helper function (not needed anymore). * Removed "framework/class-agama-framework.php" file (Moved part of code to functions.php & part of code to class-agama-core.php files). * Front page boxes disabled by default (Theme review rules). * Minor customizer changes related to pro features. * Removed agama favicon feature (same feature already is build in WordPress itself). * Removed function for backwards compatibility for title tag. * Added plugin (TGM) installation recommendations feature. * Fixed some of accessibility issues. * Fixed minor PHP notices. * Added header shrinking feature on/off. * Added alt attribute to logo image. * Minor updates in customizer area. * Fixed footer phone social icon not displaying. * Added phone number social icon feature. * Updated (improved) social icons code. * Fixed social email icon not showing issue. * Fixed infinite scroll load more button doesn't show on tag.php page. * Fixed infinite scroll load more button doesn't show on archive.php page. * Fixed infinite scroll load more button doesn't show on category.php page. * Fixed infinite scroll load more button doesn't show on author.php page. * Fixed infinite scroll load more button doesn't show on search.php page. * Fixed infinite scroll load more button not working when blog grid layout selected. * Updated theme dark skin. * Updated "Top Border" feature to display only when header v2 & v3 selected. * Updated "Top Border" feature "transport" => "auto". * Updated "Top Margin" feature "transport" => "auto". * Updated breadcrumb to split in 2 rows when media device max-width is 992px. * Added ALT attributes to slider images. * Fixed Contact Form 7 responsivity issues. * Fixed Contact Form 7 border around recaptcha & file upload issue. * Added body typography feature into Customize -> General -> Body. * Added header textual logo typography feature. * Added navigation top typography feature. * Added navigation primary typography feature. * Added navigation mobile typography feature. * Added enable / disable HTML tags suggestion on comment form. * Added tag cloud icon on single page / post. * Extended customizer with FontAwesome icon picker feature. * Updated customizer preview for many features to partial refresh. * Updated 404 not found page styling. * Updated search form styling. * Updated tag cloud widget style. * Improved CSS inline loading speed. * Fixed top navigation social icons enable / disable issue. * Fixed static front page breadcrumb to show page title instead of "Home". * Fixed particles overflow on header image issue. * Fixed sidebar left side bugs. * Fixed blog grid layout issues. * Fixed blog infinity scroll bug. * Fixed back to top button on small media devices. * Fixed Notice: Kirki_Field::set_output was called incorrectly. "output" invalid format in field agama_slider_overlay_bg_color. * Fixed Notice: Kirki::add_field was called incorrectly. Do not use "alpha" as an argument in color controls. * Added top navigation select links color feature. * Added top navigation select links hover color feature. * Added primary navigation select links color feature. * Added primary navigation select links hover color feature. * Added mobile navigation select links color feature. * Added mobile navigation select links hover color feature. * Added mobile navigation custom title below hamburger menu icon. * Added mobile navigation write custom text below hamburger menu icon. * Fixed slider buttons not clickable when particles is enabled. * Fixed mobile navigation links color and menu background color issue. * Updated mobile hamburger menu icon styling & animation. * Added Agama Blue contents hook. * Fixed minor header menu styling issues. * Added slider particles js feature. * Added header image particle js feature. * Added frontpage boxes global enable / disable feature. * Added WooCommece 3.x support & fixed minor bugs. * Updated blog layouts template files. * Updated frontpage boxes code. * Updated customizer frontpage boxes icon color (transport = postMessage). * Updated footer widgets area dynamic bootstrap class per active widgets. * Fixed mobile menu child styling issues. * Fixed frontpage boxes animated effect minor bugs. * Fixed posts animated effect minor bugs. * Fixed minor WooCommerce styling issues. * Fixed blog posts animated minor bugs. * Fixed blog small thumbs layout, big space between posts on mobile devices. * Added frontpage boxes loading animation feature. * Added blog posts loading animation feature. * Removed Agama favicon feature & enabled default WordPress favicon feature. * Updated customizer header section. * Updated customizer styling header section. * Updated customizer primary color option (transport = postMessage). * Updated customizer header background color option (transport = postMessage). * Updated customizer header shrinked background color option (transport = postMessage). * Updated customizer header borders color option (transport = postMessage). * Updated customizer logo hover color option (transport = postMessage). * Updated customizer navigation color option (transport = postMessage). * Updated customizer navigation hover color option (transport = postMessage). * Updated footer widget area background color option (transport = postMessage). * Updated footer copyright area background color option (transport = postMessage). * Added blog post meta date (on | off) feature. * Added blog post meta category (on | off) feature. * Added blog post meta comments counter (on | off) feature. * Updated customizer blog sections. * Updated small thumbs blog layout post meta. * Fixed Header V1 header shrinked background color bug. * Fixed minor post meta bugs. * Fixed (jQuery [undefined?32123123] 404 not found) bug. * Updated kirki framework to latest stable version. * Updated FontAwesome to latest stable version. * Fixed dashed lines issue when comments are disabled. * FIXED: Warning: Cannot modify header information bug. * ADDED: Header V1 background color feature. * ADDED: Slider general section with few features. * ADDED: Frontpage boxes general section with few features. * UPDATED: Header image & slider can work on same time now. * UPDATED: Theme translation files. * UPDATED: FontAwesome files to latest version. * FIXED: Header V2 & V3 slider height bug. * FIXED: Agama slider image caching issue. * ADDED: Transparent header (Header V1) feature. * ADDED: Transparent header (Header V1) styling feature. * ADDED: Logo max-height feature. * ADDED: German translation files (Credits: Thomas Moritz). * UPDATED: Rewritten customizer options completely. * UPDATED: Mobile menu completely rewritten. * UPDATED: Language translation files. * ADDED: Pages / posts will became full-width if no active widgets in Main Sidebar area. * ADDED: Frontpage boxes icon / image URL feature. * ADDED: Search page post thumbnails on / off feature. * FIXED: Search page blog grid layout bug. * FIXED: Mobile menu always expanded bug. * ADDED: Breadcrumb background color feature. * ADDED: Breadcrumb links color feature. * ADDED: Breadcrumb text color feature. * ADDED: Footer widget area background color feature. * ADDED: Footer bottom area background color feature. * FIXED: Current menu item background color on navigation. * UPDATED: ReStyled footer area. * ADDED: Upload favicon feature. * ADDED: Breadcrumb feature ( enable / disable ). * ADDED: Breadcrum style feature ( mini / normal ). * ADDED: Disable breacrumb on homepage / frontpage feature. * ADDED: Enable / disable post author feature. * UPDATED: Dark skin stylesheet. * ADDED: Custom CSS feature. * ADDED: Tag cloud support (widget, posts). * ADDED: Enable / Disable featured thumbnails on single post. * ADDED: Enable / Disable Post Meta Details (date, category, author, comments count). * FIXED: Footer links color issue. * FIXED: Sticky top menu max-width issue. * ADDED: Image support feature on frontpage boxes. * ADDED: Contact Form 7 style support. * FIXED: issues with menu assign checkbox visibility. * ADDED: Blog thumbnails url enable / disable feature. * ADDED: Top menu feature on sticky header. * ADDED: New social icons style. * IMPROVED: Menu hover in, hover out animation. * ADDED: About author enable / disable feature. * ADDED: 1 new blog layout (small thumbs) feature. * ADDED: sidebar align (left / right) feature. * ADDED: Enable / Disable "Read More" blog url feature. * CLEAN: Unused files & code. * FIXED: Blog grid style, comments overlap with posts. * FIXED: Few issues in mobile navigation. * FIXED: Duplicated post categories bug. * IMPROVED: Infinite scroll, added trigger feature (auto / button). * IMPROVED: Blog posts styling. * IMPROVED: Comments layout restyled. * FIXED: textdomain issue in customizer. * ADDED: Layout style options (Boxed / Fullwidth). * FIXED: Blog list feature thumbnail size issue. * IMPROVED: Right to Left (RTL) stylesheet issues. * IMPROVED: Header style select options. * IMPROVED: Sticky header navigation. * IMPROVED: WooCommerce shop page. * FIXED: Search page results. * IMPROVED: Sticky header responsivity. * IMPROVED: Logo centered on responsive devices. * FIXES: multiple theme fixes. * FIXES: multiple theme fixes & unnecessary css code cleaned. * ADDED: enable/disable top navigation menu option. * ADDED: four widget places in footer. * ADDED: footer custom copyright option. * ADDED: Serbian language translation. 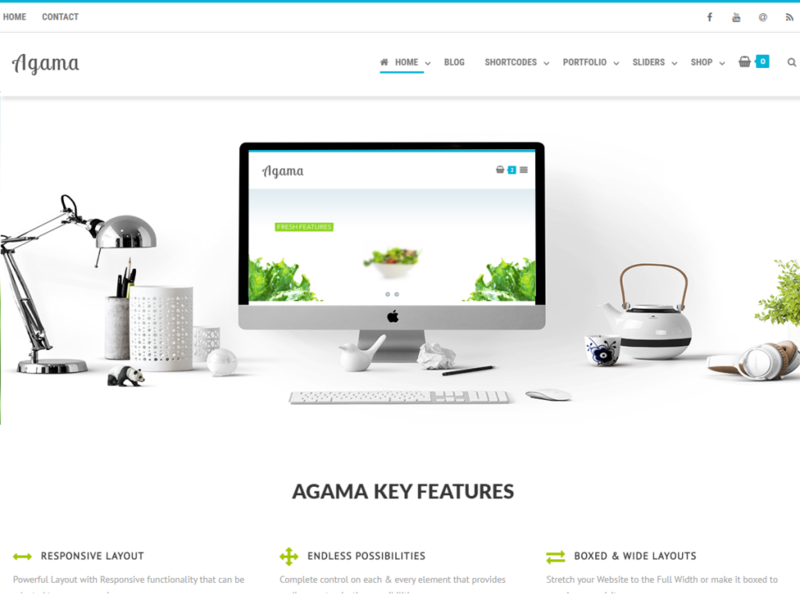 Agama free WordPress theme is compatible with WooCommerce plugin.